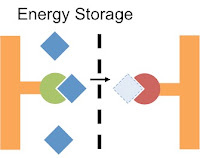 Methane storage in porous polymers. Inexpensive nanoporous polymers were constructed from widely available building blocks to deliver high Adsorbed Natural Gas (ANG) capacity when cycled between 5 and 100 bar pressures. Nanoscale chemistry for high performance Li-ion batteries. Cobalt oxide (Co3O4) nanoparticles are grown inside the pores of COPs providing caging effect for effective expansion and contraction in Li-ion battery charge/discharge, leading to more than 300 cycles without deterioration (J. Mater. Chem. A 2015, 3, 15489). Flexible Li-ion batteries with half mm thickness were constructed (Nano Lett., 2015, 15, 2350).